Update 3/15/18: Dr. Christopher Stepien’s Level 1 CrossFit Certification expired in 2014 and is therefore, no longer active. Barefoot Rehab’s pain-fixing services have no association with CrossFit, Inc. When I was in chiropractic school, I observed a guy panting, moving ridiculous amounts of weight in machine-gun fashion, before falling to the ground and sweat-angeling all over the nice, black mats no one would dare to lie down on. 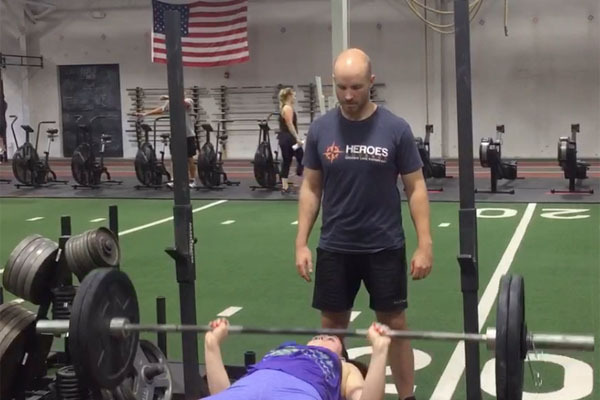 A few weeks later, Corey and Shanna Duvall (of CrossFit Asheville) sucked me into the CrossFit world, allowing me to fall in love with a worldwide community that was addicted to fitness (whether that addiction was healthy or not, would be determined later). Thinking back to those days, I was a ripe student looking for answers. How does one get out of pain, prevent disease, get fit, and live as able a life as possible? Do I, as a chiropractor, adjust people once per week for the rest of their lives? Do they simply need to eat clean and avoid pollutants? Does the mind and the quality of one’s thoughts affect health and longevity? CrossFit answered all of those questions. CrossFit became the center of what I believed to be the hub of a health community that actually transformed people’s lives. CrossFit was the engine for how I would practice chiropractic and get people healthy … get people off lipitor, lose weight they just couldn’t lose, and look good naked in front of the mirror! Since that time, I’ve seen CrossFit get people moving when nothing else would work. My dad, Papa Chris, just had surgery this past week to remove a cancer in his stomach. He didn’t mind the surgery. He did mind that he wouldn’t be able to come to Heroes Journey for a month. This was after 20 years of failed efforts by me to get him to stop smoking, lose weight, and be fit so I could have him around for my kids when they’re born. With all of the benefits, I’ve also seen the dark side of CrossFit. The sadness of missing your friends who you sweat (and sometimes bleed) next to. I’m super grateful that CrossFit is evolving for the better. 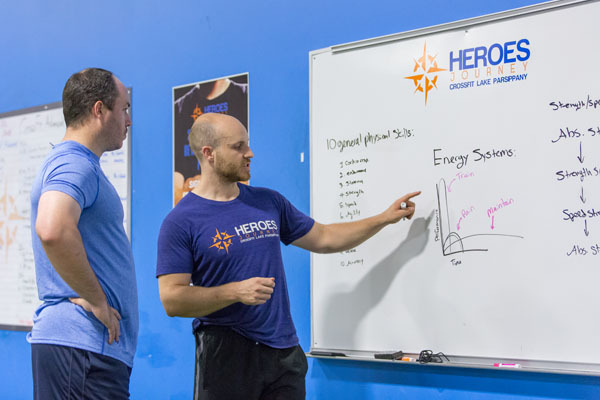 Leading the evolution are the coaches at Heroes Journey in Parsippany, NJ. 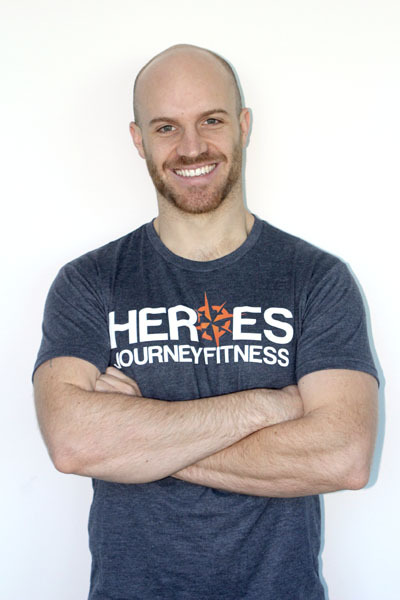 Thomas Madden is owner and head coach of Heroes Journey. He is largely responsible for the cutting-edge Individual Design Program at Heroes Journey. It’s a program that I, as a chronic pain provider, love referring people to. A client who has failed over and over again with getting fit and feeling a part of a community can finally achieve the results they’ve always wanted to. This seemingly unobtainble goal is accomplished by the hand-holding of a loving, supportive, highly knowledgable coach that guarantees results. I’ve asked Thomas to speak with you, readers who might be scared of CrossFit and still really want to achieve your fittest, healthiest, and happiest selves. A new year is coming. There’s no better time for a new you. People get injured doing CrossFit. Like every other physical activity and sport, there’s an inherent risk of something getting tweaked, pulled, sprained, strained, inflamed, or thrown out. But hey, sports are fun, intensity is fun, sweating hard and jacking up the feel good chemicals is fun. So you basically have two choices right? Choice #2: Sit on the sidelines and decide that you just have too many limitations to actually get fit. Hmm…I don’t like either of those choices for you. I’m here to tell you there’s a smarter way to get fit. In this post, I will guide you through some simple, bang-for-your-buck tips you can take to stay injury-free, have fun when you workout, and keep getting your sweat on for the rest of your life. Implementing just one of these tips can be the difference between success and failure. My recommendation is that you pick the one that speaks the most to you and implement it in the next 7 days by putting it into your schedule. That means opening up your calendar and literally scheduling a 15 minute time block that you reserve for this one thing. People who don’t schedule their time usually don’t follow through. Schedule your time and your body will thank you. Tip #1: Assessment? Pshh… I am a flawless, perfectly functioning organism. Would you take pills from a doctor who didn’t ask you any questions about the symptoms you were having? Would you go to the store and buy clothes without trying them on? Well, we don’t think you should follow exercise prescriptions without knowing what your biggest limitations are and how you might respond to certain exercises and their dosages! Let’s face it – very few people have a body that isn’t jacked up in one way or another. AND your body is different from his, hers, and everyone else’s. Does your knee hurt when you squat? Do you have trouble getting your arms above your head? You’d probably want to figure that out before you slap weights on a barbell and say 3,2,1…go! Tip #1: Find someone who has some experience in identifying where you have some imbalances. Not only that, but find someone who knows when to refer out when the issue goes beyond needing to mobilize and foam roll. Tip #2: Everything in moderation…except wodding, right?! You’ve probably heard or read somewhere that you don’t get stronger WHILE you’re working out – you get stronger while you’re RECOVERING from working out. You’re about to read it again. Ready? You don’t get stronger WHILE you’re working out – you get stronger while you’re RECOVERING from working out. Listen, I get it, working out can be a rush. It’s a break from life’s garbage. For one hour you get to block out all the noise in your life and just feel like a human being ready to do stuff that human beings should do. How could that NOT be something you want to do every day of the week?? Sadly, it’s another case of moderation being the key to success here. Constant intensity is not the answer to longevity and injury-free fitness. That’s another blog post itself, but here it is put simply: Your body is under no obligation to differentiate between you voluntarily doing “Fran” and running away from a bear, Revenant-style. If you constantly ask your body to stay in “fight or flight” mode without giving it the time it needs to recover and appropriately adapt to stress, you’re going to plateau at best, and get injured or develop chronic fatigue at worst. You see – it’s all about pushing your body almost to its capacity, then easing up…recovering…then pushing it a little more. THAT is how we get better. Humans are extremely resilient, but over a long enough time period, it will stop putting up with you. Tip #2: If you don’t have a coach to manage your intensity from day to day, week to week, then CrossFit at 50% of the intensity that is normally prescribed. You are probably thinking “That’s way too low. I’m going to ignore that number.” Do so at your own peril. #3 FACT OR FICTION? Carbs are evil. Protein is good. Eat as much fat as you can handle. Yeah, not exactly. Paleo is a wonderful concept, but wow do people know how to run away with a concept and butcher it until it’s almost unrecognizable. Of course we want to move away from processed foods and move toward lean meats, veggies, fruits, nuts, and seeds, etc. But we are really throwing out the baby with the bathwater when we throw carbs out and pretend that eating a pound of bacon a day is okay. With high intensity (whether moving really quickly against the clock, or lots of weight on the bar) there is a need for sugar. Sugar is the body’s preferred energy source. You need it, especially if you’re CrossFitting. It’s no wonder that people burn out within a year to eighteen months of intensity based training when they are only running on protein and fat. After a CrossFit workout, or any intense training session, your muscles are in need of refueling the sugars they used to get through the crap you just put them through. This is what they call “refilling the glycogen stores”. Glycogen is just a fancy word for the storage form of sugar. All the nutrition stuff gets pretty hairy pretty quick, so just remember this – carbs are ABSOLUTELY necessary to aid in pre-fueling, post-workout recovery, and general metabolic functions for your body. This means you need them to feel good during a workout, to recover faster for your next workout, and to spare muscle loss. Additionally, without carbs, you’re likely to feel pretty run down, especially if you don’t take advice in #2. That’s an injury waiting to happen. Tip #3: Eat carbs (sweet potatoes, potatoes, or white rice), always checking in with your body to make sure it’s not causing negative side-effects. The best time to eat carbs is after a high-intensity workout. Tip#4 FACT OR FICTION? All CrossFit gyms are created equal. In a perfect world, the above statement is true. Sadly, like everything else in life, there exists vast differences in the quality of products that are offering similar services. You are in the unenviable position of picking one of the literally dozens of affiliates and other gyms within a five mile radius. Quality: Steer clear of the gyms where the introductory sessions are “free”. I know, I know, what for, right? I’ve been around the block, and you probably have to. You get what you pay for. If you’re paying nothing, the value probably isn’t there. You should start by selecting a gym that actually puts a value on the service they are delivering. If they are charging people, they are looking for people serious about results. If you are paying, you are looking for serious results. That’s alignment. 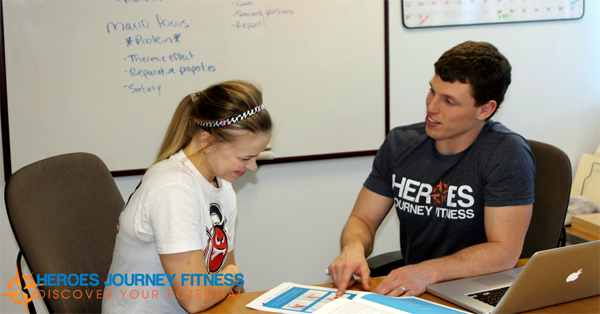 Intake Process: If you’re not being consulted with, or assessed immediately, you’re not at the right gym. Professionals in fitness want to know their clients. They want to make lifetime relationships with you. That’s a good thing and it means this: They are doing this as a career, not a hobby or a side job. Their success rides on your success. So, if no one is sitting down with you to get an idea of what you’re about and what YOU want, then no one is advocating for your goals and the plan to get you there. If you’re not being assessed out on the gym floor, you’re not being serviced by professionals. It’s harsh, but it’s the simple truth. Good programming: Keep an eye out for programming that is all intensity, day in and day out. If the workout is always for time, always an AMRAP and always putting you on your back in a puddle of sweat, you should consider what the thought process is behind the design. Remember, intensity is okay, but in the right dosages and NOT every single day. If the people around you are getting injured, it might be time to ask yourself what’s going on. Scope of practice: You need to rely on the gym you are at to refer you out if you have a condition or issue that is beyond the scope of practice for a coach. For instance, if you have chronic pain in your shoulder, knees, or hips, there’s most likely no amount of lacrosse ball smashing or foam rolling that is going to help you. Further, there is likely little to nothing a coach can do to figure out what that problem is, let alone how to solve it. So look for coaches who are competent enough to know when the problem is beyond them and you need to consult with someone who has the skill set to diagnose, resolve, or refer out even more. Tip #4: If you don’t go to a gym, use the four standards above to score the top 1-3 gyms you’re considering. If you already go to a gym, score it and make sure that the members’ health and longevity is a priority of your coaches. Tip #5 Get a coach, you deserve one. You don’t have to quit your day job, live at the gym, and get sponsored to justify having or needing a coach. Everyone can benefit from a coach. What would you need one for if you’re not “that serious about fitness”? It doesn’t matter how much you go to the gym, or what your goals are. What matters is that you have a relationship with someone you can go to when you get stuck with a movement, need help with an injury, or want a friend to talk to about life. Coaching is more than counting reps and correcting form. It’s about creating a bond that transcends beyond squatting and eating broccoli and chicken. It can be the difference between having an “okay” experience at the gym, and a life-altering, mind-blowing life transformation you never thought was possible. Again, super fluffy, but I’ve seen it happen time and time again. 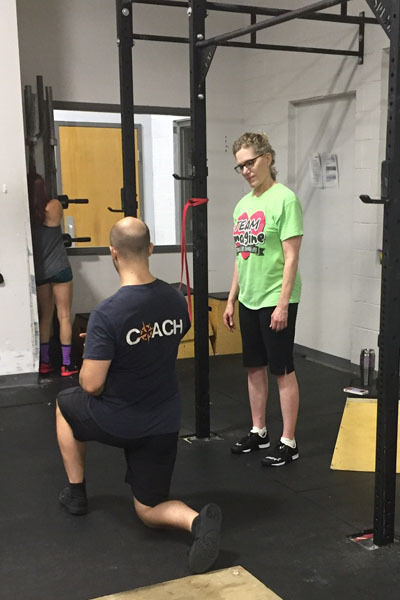 Your success from the perspective of staying injury free, working out for the long term, and being happy with your gym experience increases exponentially when you have a coach for life. Tip #5: Get a coach. There you have it folks, some golden nuggets about staying healthy while trying to be healthy. It’s not easy, and requires a lot of work and thought on your end; but what in life is worth doing that doesn’t take a little bit of figuring out? There’s somewhat of a risk any time you decide to be more active. If you take care of business and seek out services that will provide you with the tools you need to stay safe, though, you really CAN CrossFit for the rest of your life and have tremendous success while doing it. I look forward to see which tip you’re going to implement if you’re scared of CrossFit, want to stay healthy, and avoid injury in the comments below. With everything said, let’s be honest, you’re human. I don’t know about you, but I have enough willpower to avoid the first cookie, and maybe the second one. Once the third through twelfth cookies make their way in front of my line of vision, they’re going in my belly. No ifs, ands, or buts. With some accountability and planning for my goals and a coach’s willpower, I can (and have, in the past) avoided all of the world’s delicious cookies. You can avoid cookies, too. You can get as fit as you dream to be, too. Promise. Because you and I both know that if you were able to hold yourself accountable for losing that weight and reaching your performance goals, you would’ve done it by now. Lucky for you, Coach Thomas and Coach Chris have begun to see clients virtually, worldwide. Interested in finally, once-and-for-all, reaching your health and fitness goals? Email Coach Thomas about the Virtual Individual Design Program by clicking HERE. What has your experience been with CrossFit?? If you’ve wanted to try your hand in fitness but have been scared of CrossFit, what will you commit to in the next week to set yourself up for fitness success? Feel free to tell us below.